Protesters stand arm-in-arm as they block an entrance to the U.S. Immigration and Customs Enforcement office in San Francisco, Calif., on May 1. 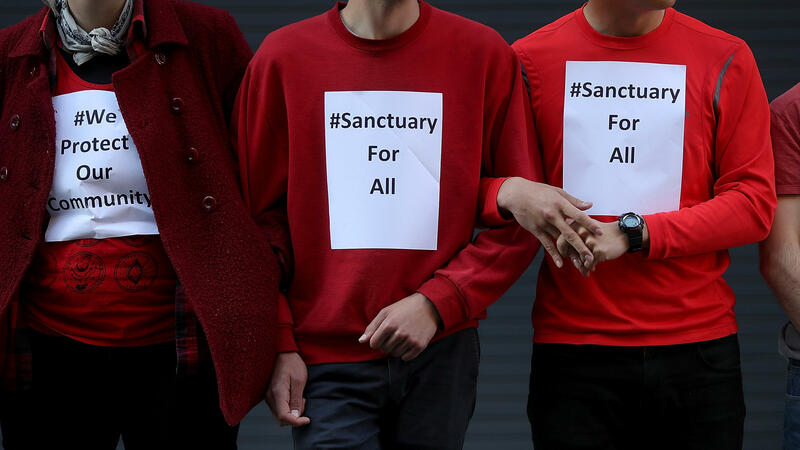 San Francisco sued the Trump administration over its threats to cut grant money to cities that don't fully cooperate with federal immigration authorities. "The defunding provision instructs the Attorney General and the Secretary to do something that only Congress has the authority to do – place new conditions on federal funds," he wrote. The judge had previously issued a temporary injunction blocking the policy, as did a judge in Chicago. "This order plows no new ground," Orrick wrote — although this injunction, unlike the previous ones, is permanent. In the controversial executive order, signed in January, Trump sought to deny federal funds to so-called "sanctuary cities." Those are jurisdictions that refuse to share some information with federal immigration officials, as a way to partially protect some people who are in the country illegally. Trump's order said such jurisdictions "are not eligible to receive Federal grants, except as deemed necessary for law enforcement purposes." In response, multiple jurisdictions sued the Justice Department, including the city of San Francisco and the county of Santa Clara. The city and county alleged that the executive order was overbroad, unconstitutionally coercive and "void for vagueness." The federal government maintained that a follow-up memo from the attorney general clarified the policy and limited its scope. In that memo, Jeff Sessions wrote that the executive order only applies to grants administered by the departments of Justice and Homeland Security, not all grants, and can't be applied in any way that would violate constitutional authority. Judge William Orrick ruled against the federal government, writing that the executive order was "unconstitutionally broad" in its effect and evidently coercive. He noted that Trump has called the executive order a "weapon" to wield against cities. And he rejected the idea that the attorney general's memo made the executive order constitutional. Orrick called the memo an "illusory promise," a non-binding document with an "implausible interpretation" of the order, which "does not change the plain meaning" of Trump's words. Because the order "is unconstitutional on its face," the judge said, a nationwide injunction is "appropriate." Department of Justice spokesman Devin O'Malley responded in a statement, saying, "The District Court exceeded its authority today when it barred the President from instructing his cabinet members to enforce existing law. The Justice Department will vindicate the President's lawful authority to direct the executive branch." "The sticking point over the local law enforcement grants centers on two new conditions the Justice Department has placed on the program: It wants jurisdictions to give federal immigration authorities access to their jails and to provide at least 48 hours' notice before releasing an undocumented immigrant in custody. "Some localities refuse to do so. They say they have policies in place that prohibit them from handing over immigrants to federal immigration officials without a warrant from a judge. They also say the DOJ's new conditions would make members of immigrant communities less willing to come forward and cooperate with local law enforcement for fear of being deported. "Local officials use the grants for a range of things, from hiring more police officers to buying new police cars, computers and even bulletproof vests. Some communities use the money to fund public safety programs to help, for example, at-risk youth or to combat drug use."